We have a tendency to think that the noun is the first part of speech we learn, so it’s automatically simple to locate, which isn’t true at all (it’s true we learn it first–just not true that it is simple!). A noun can become many different parts of speech. 4) Let’s go to school now (finally, the noun). The same thing is true of capitalization–we learn it early, yet it is far from simple. *Cap this in this instance but not in this. *Cap this when it is used as an address but not when it is used in a non-address scenario. Into that madness, enter the proper adjective–another capitalization nightmare, in many cases. Essentially, a proper adjective is a proper noun used as an adjective. The key to using this properly (with the proper capitalization) is knowing for sure that the word is usually a proper noun (without having context, in many cases!). So…. 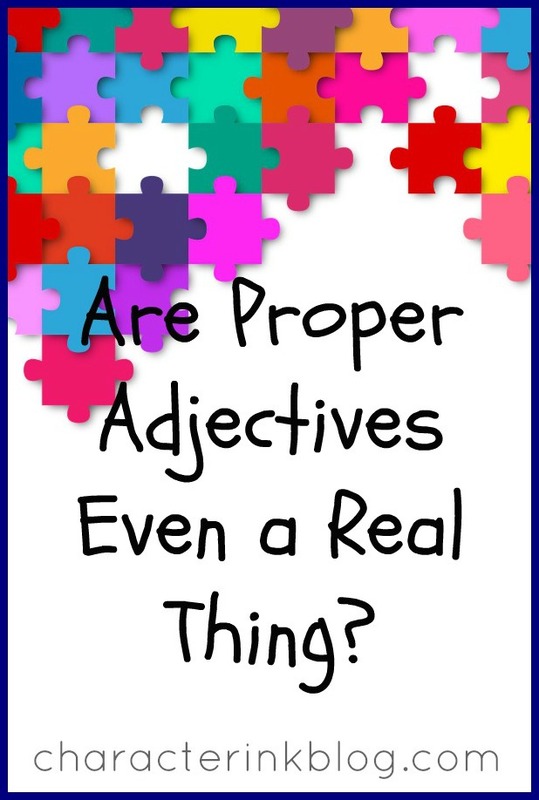 a proper adjective is essentially a proper noun that has been put into adjective form. Words are different parts of speech based, oftentimes, on their suffixes. For example, loveliness (with the ness suffix) is a noun…but changing a suffix often changes a word’s part of speech. Thus, lovely is an adjective; loveliness is a noun. There are many other difficulties with proper adjectives and proper noun elements within common nouns. No wonder our students are confused! It is up to us to help them with these challenging usage scenarios. 2) Giving them lots of practice with them–and verbal feedback and discussion of the practice sentences and exercises. A word about number three above. In my books, I use a TPA approach—Teach-Practice-Apply. This means they learn the information in the teaching portion of the book. Then they practice the skills with little or no grading. This is done in passages of material usually–completely in context. Then they apply it in exercises/assignments, and, ultimately, in the Checklist Challenge and their writing–where the rubber really meets the road and where we want the application to really sink in. Let’s make grammar, usage, spelling, writing–all the things–as easy as we can for our students!